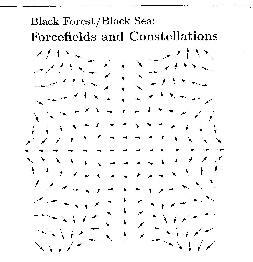 Black Forest/Black Sea - "Forcefields And Constellations"
This is a duo project by two Providence, Rhode Island folks. It is simply finger picked guitar (also bowed at times) and cello and effects. The band just recently played a tour in Europe (I did not see them). The majority of the tracks on the CD were recorded live by the duo with some special guests on a few tracks. The 13 tracks are an interesting collection of instrumental music. The music is sometimes beautiful, sometimes haunting, but somehow always reaching for a space somewhere on the other side. I don’t know how else to describe it. For more information you can visit the Black Forest/Black Sea web site at: http://www.cs.brown.edu/~mag/bfbs.